When we’re asked about speech recognition software, it’s often from new users hoping to automate their transcription process. Although InqScribe doesn’t include any speech recognition technology, you can easily use InqScribe in conjunction with other speech-to-text software. Dragon NaturallySpeaking is the most popular speech recognition product on the market. “Dragon” has been around for over 17 years, with version 13.0 recently released for PC by Nuance Communications. For Mac users, there’s also an OS X edition called Dragon Dictate. In this article however, we’ll be looking at Dragon NaturallySpeaking 12 Home Edition. As you might guess, Dragon essentially converts your voice into text, also allowing for command triggers such as “Open My Documents” and “Delete Line.” Although true transcription automation isn’t quite there yet, you can use Dragon effectively with your own voice. Computers have a hard time distinguishing a single voice from the noise and general messiness of most recordings. There are often ambient sounds or background chatter in even the most pure recordings. It’s difficult for speech recognition programs to remain accurate moving from speaker-to-speaker. Everyone’s voice sounds a little different, so programs like Dragon work best by training with and focusing on one voice. Even in ideal conditions, speech recognition isn’t perfect. It’s never going to be 100% accurate because it mishears you or maybe it just doesn’t understand a colloquial word. A lot of what we “hear” from language comes from context and nuances in our speech and body language. Speech recognition technology just isn’t advanced enough to pick up on such complex information. So, if you’re still interested in trying out automation, the Pro and Legal Editions of Dragon 12 support speech-to-text conversation from audio recordings (click here for a PDF comparison of these editions). This feature is intended to work only with your own, trained voice due to the limitations explained above. However, there’s nothing stopping you from trying out the voice recognition on multiple speakers. One possible transcription method is to run an initial pass with Dragon, and then use InqScribe to follow along and edit its mistakes. I’ll note that we haven’t tested this method, and I imagine the results will vary widely from recording to recording. Check out this video on how to transcribe from an audio recording with Dragon 12 Pro. 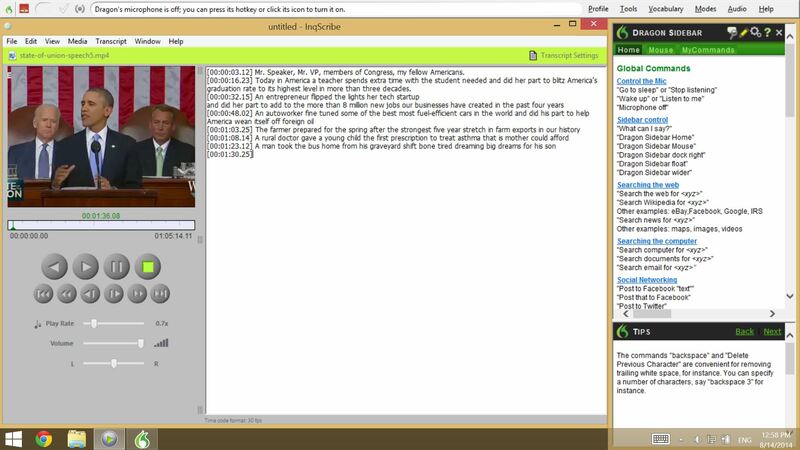 I found myself using voice recognition to get down the general text of the transcript while controlling media playback and timecodes using InqScribe’s keyboard shortcuts and my mouse. This frees your hands to focus on media manipulation. It’s also nice to have the precision of keyboard shortcuts for inserting timecodes. How well does parroting work? As a speech recognition software, Dragon does a pretty good job of understanding your voice. It will even improve the more you use it. There is a bit of a learning curve, which mostly comes from training yourself to be effective with voice commands and corrections. Factoring in these corrections, I found parroting with Dragon to be slower than manually typing the transcript. This will certainly depend on your typing speed and how proficient you are with Dragon’s voice interface. Be aware that prolonged sessions will leave your voice tired. This might seem obvious, but you’ll get physically fatigued much faster than by typing normally. For this reason, I don’t think I would recommend Dragon to knock out wordy transcripts. I know my voice tires easily, so if you’re used to talking all day, it might be less of an issue for you (hello teachers). Overall, I’m not sure that I would recommend Dragon to someone who has no issue manually typing a transcript. It just doesn’t offer a clear advantage. If, however, you’re plagued by slow typing, mental blocks, physical impairments, or just love the sound of your own voice, then Dragon can be a great tool. Just be willing to make it through a high learning curve before you can really start plowing through transcripts.